For my third restaurant, I wasn't sure where I would enjoy a WinterDine supper at. In the back of my mind, I was thinking Mavors, Big Orange Lunchbox, and Globe. I was kinda craving some sorta Hamburger, which is something I associate back to the Big Orange Lunchbox with. I'll admit, my first few experiences here weren't so grand, infact, they all sucked. But, I was pulled in by the lure of a associate who started working here recently. Someone who has quality written all over him. So, I went back and enjoyed it on my third go. As such, the burger taste remained in my mouth and I was craving a burger. So, I tweeted the Big Orange Lunchbox about doing WinterDine there, waited over the course of a few hours, no response. So, next on my list, was Globe. Globe was playing inside my head after my Internet Mother and I were talking about it earlier on Facebook. And having visited Globe earlier in the day, the General Manager asked when I will be in for WinterDine. She informed me to give her a headsup and they'll have a nice 3 course meal setup for me. So after giving up on my first choice, I went with my second and gave her a headsup on Twitter. I was excited to checkout Globe's menu. 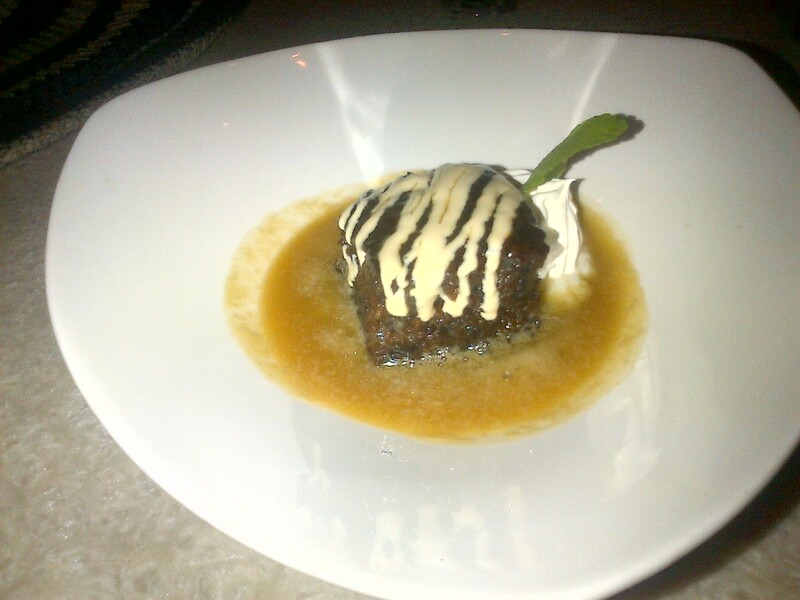 Afterall, a couple years ago, I thoroughly enjoyed the WinterDine menu at Globe World Flavours. It was Chicken Stuffed with Lobster if I recall correctly. And it was one heck of a dine. An entirely gluten free menu doesn't matter as much to me as it does for some, but, I went with the Soup, Atlantic Salmon and Sticky Date Pudding. The Soup arrived shortly after my bread arrived. I wasn't expecting the bread but I believe it is usual tradition for Globe to give you bread when eating in. So, I enjoyed it. If I was to be critical of the bread, I'd say, frozen butter and bread doesn't exactly work. This whole concept of serving frozen butter seems to be the norm on PEI, I believe it is part of our health inspections that butter has to be served frozen. Why, I am not sure. But its rather annoying trying to spread frozen butter on bread or a Starbucks Muffin. When visiting Starbucks and getting a muffin, I usually ask for a cup of hot water to help soften the butter. None the less, I attempted to spread the frozen butter on the bread as well as possible. Right after my failed attempt at spreading the butter, the 1st course came out. 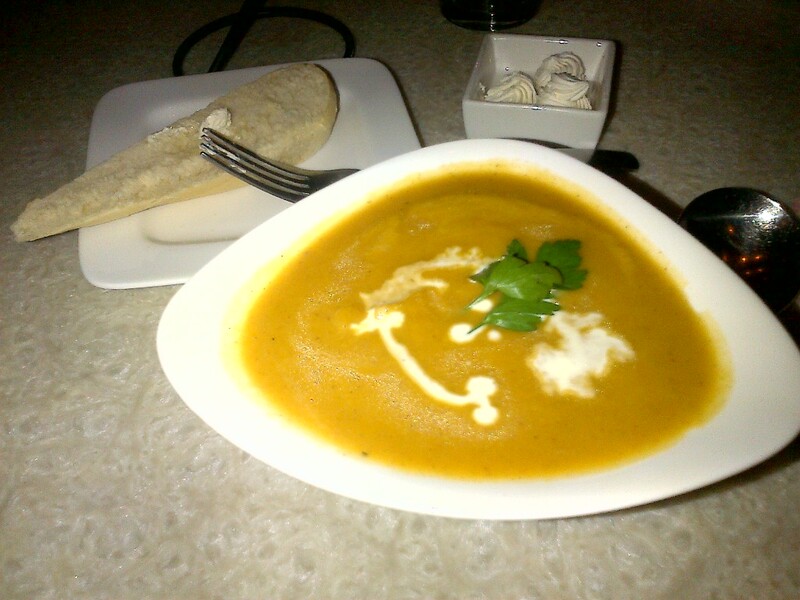 The Roasted Butternut Squash Soup. Perfect timing as I gave up on the whole butter concept and used the bread to dip in the soup. The soup was thicker, it was good. Given the temperature on our beautiful Island over the past week, it was cooked properly too! Hot, not boiling or scolding, but hot. It was good going down reminding me of something I'd eat after a cold winters day. It wasn't the best soup I've ever tasted, none the less, it was good. I'd also give bonus marks for the smiley face within the soup. Next up was the main course. The main course took a bit longer to make then my other 2 WinterDine experiences. But given we're talking quality food with WinterDine, I don't expect it to be thrown into a microwave and ding! I knew I was in trouble when it came. I was already partially feeling full off bread and soup! None the less, out came the salmon. As it came closer, I noticed there was a delicious smell. Not only did it look good but it smelled delicious! 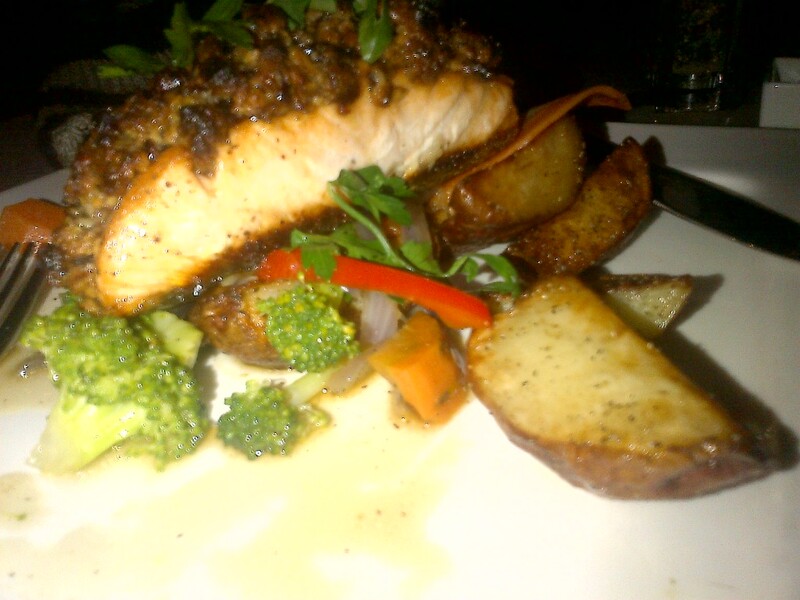 The salmon sitting on top of the vegetables was laid out pretty well. Where do I begin? Do I start with the vegetables and then salmon, then mix it up? Yes so be it. The vegetables were mainly good, but the broccoli was pretty much tasteless, perhaps overcooked a tad. Onto the Salmon and it was delicious. The Walnut & Cranberry crust was a nice touch and really added to the taste. Writing this afterwords, I am starting to crave another one actually. Just look at that picture! It tasted as good as it looks. I didn't finish it all. I had to stop eating the vegetables and potatoes or I woulda been stuffed prior to the arrival of dessert! Usually that's no biggie but in the case of WinterDine, I wanted to try it all. Now onto the Sticky Date Pudding. It was equally as good and warm. The serving was a nice size, although I coulda skipped it as by the time I was done, I was ready for a nap. Overall, the service was great. Asking how things are is always a sign that they care and ensuring my glass is always full of water is definitely a good thing. The bar has been set with a new front running WinterDine meal.